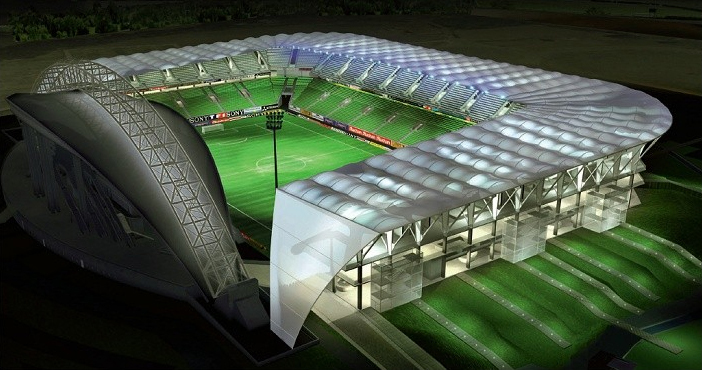 Though drawn back in 2003, the expansion plans for Stade Gabriel Montpied have constantly been on hold. Now this is about to change as the city council voted in favour of launching the phased process. It wasn't unanimous by any means with 48 votes in favour, 35 against and 2 abstentions. Currently offering only one permanent grandstand, the municipal stadium has three temporary anciliary stands to meet Ligue 2 demands and this will gradually change. First, in 2021-2022, the new east stand will be erected, with some 5,400 seats. This is the part already approved, at present expected to cost a total of €34 million. According to mayor Olivier Bianchi, up to 40% will be covered with external funding, private and public. In total the expansion is estimated to cost €77 million, though might end up significantly higher as a phased development. Once the new east stand is ready in 2021, the stadium should offer over 16,000 permanent seats. Then the new south stand and corners extending the east one will be added. Finally, the north end will finish the new crescent-shaped addition to the iconic main stand. 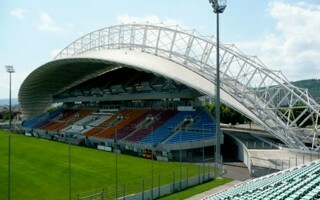 This way Clermont-Ferrand will have a 30,000-seats stadium able to host a TOP 14 rugby game and other internationals. On a regular basis it would still be used by Clermont Foot, though, which is perhaps the most arguable part. The Ligue 2 side needs a better stadium, but does it need a much bigger one? Currently the team has average turnout of 3,167 people per game, not even a third of avilable capacity. Increasing it three times seems excessive in terms of regular ticket demand, which is why a group of opponents launched an online petition against the expansion. They argue that only one in four Ligue 1 clubs needs a stadium of such size, while current attendances would be only over 10% of the expanded stadium. If it's any consolation to them, expansion plans can still be killed with significant time left before groundbreaking. And even if not, reaching the full 30,000 is expected to take roughly a decade.